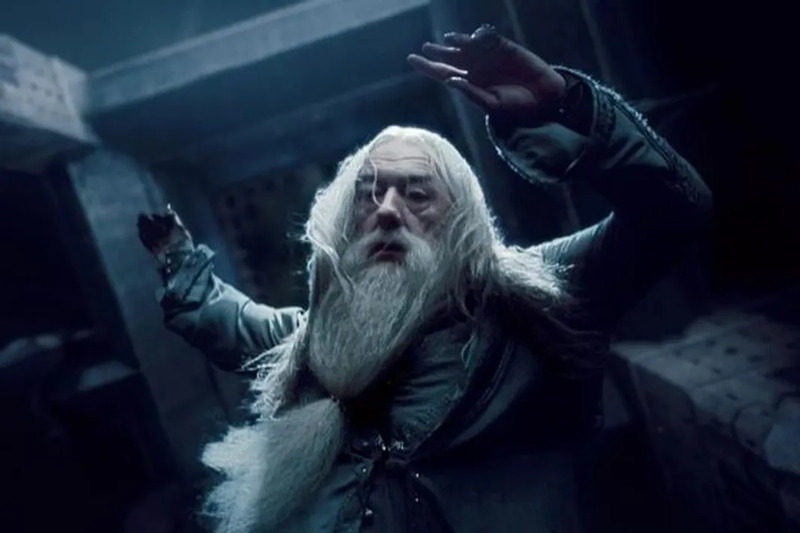 Did J.K. Rowling Tell Us About Dumbledore's Death In 'Harry Potter and the Prisoner Of Azkaban'?! If you’re a true Harry Potter fan then you’ve reread the books and watched the movies several times over. Still, J.K. Rowling‘s Wizarding World is so richly detailed, that hints and clues sprinkled throughout the saga are sometimes missed. Recently, we began re-reading the books (for the thousandth time) and we discovered something that changed EVERYTHING for us. In Harry Potter and the Prisoner of Azkaban, while we were all busy worrying about dementors and the whereabouts of Sirius Black, Rowling was warning us about Dumbledore’s impending demise. Still don’t follow? In Chapter 11, “The Firebolt” Harry, Ron and Hermione head down to the Great Hall for Christmas lunch. When they arrive they notice that all of the House tables have been pushed aside, leaving a single table set for twelve people in the middle of the room. Already at the table are Professors Dumbledore, McGonagall, Snape, Sprout and Flitwich. Our favorite crotchety caretaker Mr. Flich is also present. Besides our favorite trio, three other Hogwarts students are also indulging in the lunch time feats. Rowling describes them as, “two extremely nervous-looking first years and a sullen faced Slytherin fifth year.” That’s a total 12 people are present. As the dozen begin to partake in the food, Professor Trelawney comes bursting in the Great Hall. Dumbledore greets her by standing up and saying, “Sybill, this is a pleasant surprise.” Since he’s polite AF, invites her to join in the festivities. Immediately, Trelawney loses her sh*t. She says, “I dare not, Headmaster! If I join the table, we shall be thirteen! Nothing could be more unlucky! Never forget that when thirteen dine together, the first to rise will be the first to die!” Obviously no one takes Trelawney seriously because her predictions are usually a hot mess, and the Christmas turkey was getting cold. Except there is something we’ve all overlooked. Ron had Scabbers (aka Wormtail) in his pocket this whole time. Which means there weren’t 12 people sitting at the table when Trelawney arrived. There were already 13. BRB going to fall apart now!!! We’ll probably re-read the entire Harry Potter saga in fifty years and still find something new. After all, if there is one thing that we’ve discovered, nothing in the text is random. And we all know by now that Trelawney’s prophecies aren’t to be sneered at.